November is not the best time for new chicks to be born. I know that, but apparently the hens have other ideas. We have had more than one hatch illicit chicks so late in the year. One hen hatched out six chicks. 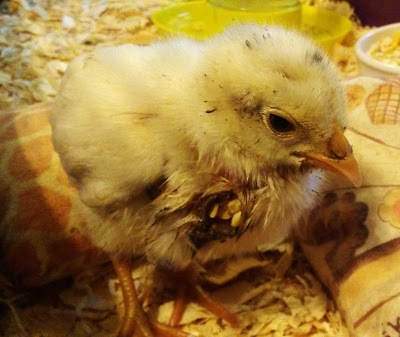 Mary, our Blue Slate turkey hen, hatched out three more chicken chicks. Ridiculous, right? If you have read about our homestead before, you know that we raise our animals as naturally as possible. Mothers raise their young with minimal interference from us- unless we must. While Mary and her chicks are doing well, Momma hen has not been so well off. About 2 weeks ago, while doing chores, I found one of her Littles cold, wet and injured in the horse field. It was alive, but barely. Chicks don't spend every minute underneath their mothers, but extended periods of cold can quickly be the end of a chick that hasn't feathered out completely. I scooped it up and brought it inside to get it warmed, hoping that it would perk up and be able to be returned to it's mother. 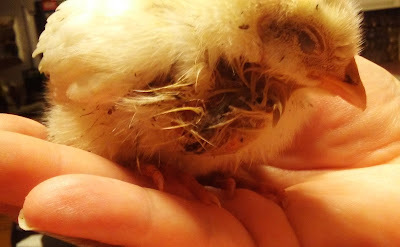 But, after getting it cleaned up, I saw a comparatively large hole in the side of the chicks neck. At three days old, I did not hold out much hope for it's recovery. The thing is, once clean and warm, it was alert, peeping madly for it's family. I could not return it to the outside. That would be a certain death sentence; chickens will pick relentlessly at injuries. I couldn't give it it's mother or siblings, but I could offer food and water. Would it even eat? I offered wet chicken crumble. It ate with an appetite. I offered water. It drank on its own. "Okay," I thought. "Two choices. Do I give it a chance? Do I euthanize to not prolong it's suffering. How long can a chick survive this way? Would it slowly starve to death? Would the wound get infected?" As I watched it walk around seemingly unfazed, eating and drinking, I thought, "It wants to live. I have to try." Cracked corn visible through the wound before repair. Our first hurdle was to clean out the area. The crop was clearly opened and just mutilated; the skin was paper thin and delicate. Stitches would be the best option for long-term closing of an open wound, but I just didn't have enough skin to work with. I decided to try to use super-glue. But, besides infection, my biggest concern with that was that I would glue the crop completely closed. Again, certain death. I don't recommend what I did. It worked- so far, but I think it was as much dumb luck as anything else. The mashed food left a horrible messy field to work in. 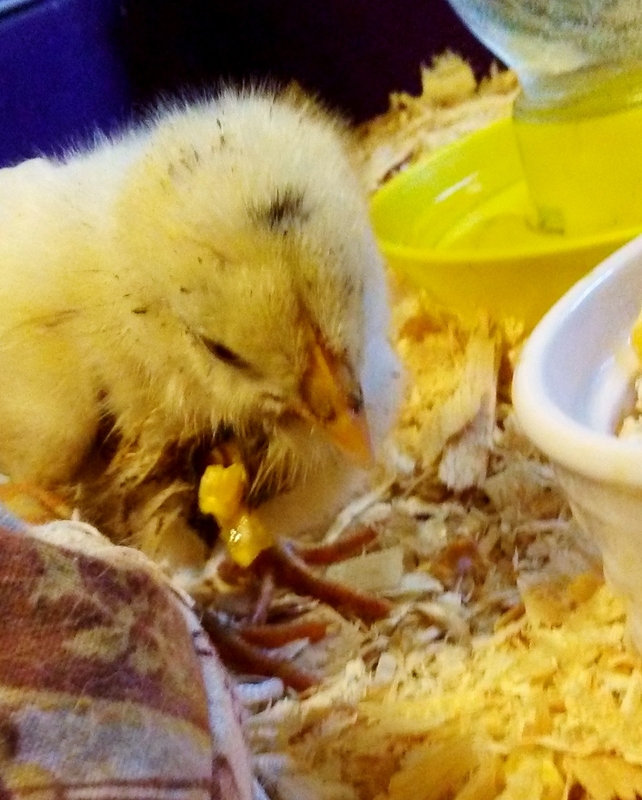 I carefully cleaned away as much of it as I could and offered the chick a bowl of cracked corn. This is not exactly ideal. It is hard and rough and could very well cause damage to the organ I was trying to save. But, I needed something that could fill out the crop, so that I could see where I was working and so that I could be certain that I was not gluing it to itself. The corn was hard enough that with tweezers, I could remove piece by piece any excess, giving me an idea of where the crop should close. Using a tweezers, I carefully pinched the delicate skin closed around the corn and using a toothpick, Sean applied superglue. It worked. I replaced the cracked corn with wet chicken crumble and little chick resumed eating and drinking immediately. We watched carefully for her to eliminate waste. And, she did- regularly. After closing the wound and a full belly, a little nap. 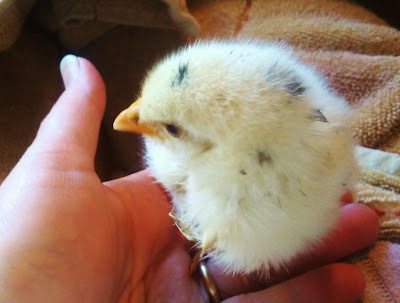 After about a week, Meg decided little chick needed a name. She called her "Nut" as in: "She's a tough nut to crack." And, she is. It has been two weeks. Nut is doing great. Her neck is almost completely healed. The only residual issue we've noted is that when she drinks, she often lifts her head several times after drinking to swallow her water. I suspect that is to do with the damaged crop. Perhaps her water does not go down as it should, but she seems to work around it. She has shown no signs of infection. She is active and as far a I can see, happy and thriving. Time will tell what the end of the story will be. I am very hopeful that it will have a happy ending- one that includes going back outside to live with the rest of the flock eventually. This video was taken just minutes after the repair to her wound. For now, little Nut spends her day hanging with the peoples or her stuffed animal duckling buddy. We'll update you as Nut grows. There are tons of things happening around here. We've had our most successful Open Homestead Day, we've gone hiking with goats a couple times, our front herb garden has been worked on, our greenhouse(!) has been framed and is ready for plastic, new displays have been created and so, so much more. I won't go back and post everything that has happened these past 5 months, but I will definitely have some posts and updates for y'all. Stay tuned! Thanks for visiting with us today. I am glad of your company.